The Eclipse Foundation announced today, that Red Hat has become a strategic member of the Eclipse Foundation. Red Hat has been a long-time solution member of the Eclipse Foundation and actively involved in the Eclipse open source community. As a new strategic member, Red Hat will take a seat on the Board of Directors of the Eclipse Foundation, strengthening its support of the Foundation. The Eclipse Foundation knows several different types of memberships with different levels of commitment. We've always been active in contributing and officially a solution member since some time. While the solution member commitment was very limited, the new Strategic Developer membership allows us to be seen as a major contributor to technology to Eclipse. 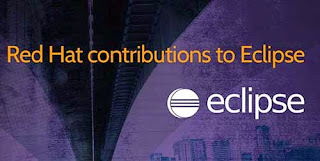 One main point here is, that we will have at least eight developers assigned full time to developing Eclipse technology and will be represented on the Eclipse Foundation Board of Directors allowing them direct influence over the strategic direction of Eclipse. Strategic members also have a seat on the Eclipse Requirements Council providing input and influence over the themes and priorities over the Eclipse technology. Eclipse Is An IDE. Why Are We Interested In That? It is true that flagship product of the Eclipse Foundation is the Eclipse IDE, but Eclipse Foundation actually has a lot of other projects that are not related to Eclipse IDE at all. Red Hat already contributes to a lot of projects and we just recently launched a website with all the details about the membership and the projects, we lead or co-lead on JBoss.org/eclipse/. By becoming strategic developer we also plan to be involved more in how Eclipse IP and Development process works and evolves. Something that become more important to make more effective for fast moving projects to feel better at home at Eclipse. On top of that Eclipse have a lot of other areas going on which Red Hat are keeping our eye on - especially in the area of web IDE’s and Internet-of-things. We’ve been contributing and continue to help making Eclipse Mars a great release, together with the rest of the community. We are especially working on fixing GTK/SWT on Linux, making Docker support and looking at improving the Java Script Development tools. If you are interested in hearing more about this or have a suggestion please feel free to contact Max Rydahl Andersen (@maxandersen). And in general, reach out to the projects we are involved with and learn how to contribute to the Eclipse ecosystem. The official blog on JBoss Tools.